Arrived at Kem Bumi Jati, Jalan Kebun, Shah Alam around 2 pm with Sofiya. The rest had arrived 4 hours earlier. Hehe. Didn’t do much after registration. Just went lepak-ing around after checking out the rooms. I took the top bunk, Pia took the lower bunk. Later in the afternoon during the Pembukaan or something like that my friends called out my name for the Timbalan Penghulu Wanita. And then that night was just kind of an introduction thing. Woke up early for Subuh. Went for perbarisan which was a bit disappointing to me. I mean, yeah, I hate perbarisan but I expected more than just “Baris, ke kanaaaaaan ‘sing!” My job as Timbalan Penghulu Wanita was supposed to be during that time but I did nothing. Hehe :p Then the rest of the day was dedicated to the perbentangan kertas kerja. Like what the rest of my friends said, we agreed that the first and third speaker were okay. But the second speaker…eh. In the afternoon we had our physical test. I thought I won't be able to do it but it's not hard la. Still, I’m not telling you my physiological age! We had our second day of LDK on this day. I admit that I was a bit emotional during the first few sessions but I’m trying my best now to just take it as opinions and nothing more. But I have to clarify that I’m only emotional because politics is something close to me. For example if you love your parents so much you will get emotional if someone talks bad about them, no? But later it got better la. And during the logo-creating session I felt like killing myself when I shouted mine! Malu! En Zairi must have thought that I love food more than I love my country. Huhu. Later we went for our kembara through the ladang kelapa sawit. And like people said, “Kalau dah jodoh tu jodoh la,” because my group (Group 14) were coupled with His group (Group 7) :)) It was nice la even though the ‘halangan’ were just a few dirty parit. I miss those times I had to go into the jungle alone at night during my high school camps. Now THAT’s a challenge. Then later that night during Isya’ it was a bit scary la for only Kero and I were at the surau as the lights went on and off. But then my heart beat a little faster when I realized who was Imam for the night :)) After LDK all of us went studying for the next day’s exam. The last day. The exam was okay but a bit f***ed up la since almost 98% of what we read DID NOT come out. That’s the thing. The whole camp was okay in a sense that as a whole it was quite neutral until came time for the exam - it was very obvious which stand we HAVE to take. Not to mention that I was snoozing 40% of the time in the hall. It's not my fault! The condition was just perfect for me to go into my dreamless sleep… Anyway, almost immediately after that the buses arrived. I was supposed to be in the bus that shall arrive later but since everyone else was running for the buses on the basis of 'siapa cepat die dapat', so did Pia and I :) We arrived at INTI around 1.30 pm and I went home around 3.30. 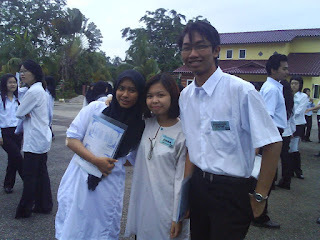 My Islamic Studies groupmate: Me, Zaim, and Bai. Another picture of Diana and me camwhoring. And my notty picture as Pia tried to kiss me. Hehe. Kidding! Most of you know that I have this deep affection of the place I currently called home. You guys know how I always talk up Kuala Lumpur like it’s the best place ever to be on this planet. But like Diana’s response to my entry similar to this one, she said that it’s the familiarity that draws me towards it. Perhaps. But today I would like to talk more on how I am proud and glad that I came from where I came from because of the people. Like I’ve previously mentioned, the part of KL that I came from is not that of the new KL. It’s not anywhere close to Bangsar or Damansara or maybe even Subang Jaya. But from where I came from, there’s this mix feeling of modernization and traditionalism. And I guess with the addition of the amazing job my parents did on raising me, I now know how to appreciate both. I mean, all this time as I was growing up my parents never once forget to remind and to show me the hard life that others are living at the same time giving me the best life they can afford. The best example I love to give people is the one and only, Food. Even though my parents take me to those fancy restaurants, they also brought me to mamaks and also to gerais scattered around our area. Maybe like I said just now, I guess my parents want for my brother and me to experience both. And me, I love both. I learnt how to appreciate expensive food at the same time how to make full use of not-so-expensive food without complaining. They taught us it is not wrong to really indulge in food once in a while (or often, in my case) as long as we remember that somewhere out there are people who can’t even afford a plate of rice. That’s why my dad loves to say, “Fuh, one coffee costs RM10. The laborers at my site work ten hours a day for a mere RM10.” But when he said that, he's not implying that he disapproves of me spending on food. Instead he’s just reminding me to be grateful. But while we can afford it, it’s okay. You guys want to know how I love to summarize my whole nineteen years of living. Well, I love doing so by seeing my life through the lens of my music collection as the years went by. Since music plays a HUGE part in my life, it reflects almost exactly how I’ve grown as a person. I think I can tell that most of you are thinking, “Yeah music is important to me too!” Maybe it is, but for me, personally la, once you discriminate music, you’ve tainted the term ‘music-lover’. When I was younger, I started by going through the whole teeny bopper phase of my life. (OMG I can’t believe that I’m telling the whole world this!) But to think again, I think every girl in the whole wide world must have gone through that phase in their life may it be New Kids On The Block or Westlife. Me? It's BACKSTREET BOYS ALRIGHT! :p I also went through the whole I-have-a-huge-celeb-crush-on-one-of-the-members-that-I-want-to-marry-him phase. Basically, this music reflects me back then. Simple, easy going, like-able. Some may despise this type of music for being too sugary sweet but at that time in your life, everything IS sugary sweet. Friends, school...everything was so simple. From there I started to follow current music more closely. It’s like EVERYBODY has to know the new hot track out there. If you don’t, you’re considered from Mars or something. So yeah, that phase of my life is mainly about acceptance. It was about me wanting to be accepted by the general people. But after that, like most teenagers, I went through my own rough phase. When I was 14 until 17 my collection of CDs included those by Blindspott, Trapt, Lostprophet, Foo Fighters and the kind. Not to forget that I was also so in love with Eminem’s sick and confused way of seeing this world. This was the time when I was against EVERYTHING. “The world is unfair! I’m not good enough! I hope this music could drown away all my problems!” How childish. Thank God I came out of it stronger as during that whole soul-searching period I learnt that God is the only one that’s able to take my pain away. Not some amazing guitar riffs. Later as I got older – and as I got closer to Shila – I went back to my roots. It's because every time I would ride with her and her late father, their Kembara would be set to 105.7, Lite FM :p Amazing enough, I know almost all the songs played by that station! Shila and I would sing along to songs from the 70s and 80s and then it made sense. I grew up listening to those songs :) That’s when I realized how much cooler songs from those eras are compared to songs nowadays. Even after 30, 40 year, you can still appreciate the beautiful melody. Today’s songs? Just a few repeated beats, and ‘said’ words (the words weren’t even sung), and people actually go crazy over them. Twenty years from now you honestly think the people from the Music Academy would mention that kind of songs ah? I don’t think so. So with that mindset, I left my rock-chic phase far, far, behind me and go for more mellow songs. My reason? I’ve became more mellow myself. But don’t freak out, I don’t immediately convert to Lite FM. I just went a step mellower – I converted to Mix FM. But then, after a few months listening to Mix FM, I got bored. There’s not much variety. So nowadays, I just listen basically to…anything. I guess you can say that I’ve come to be more comfortable with myself that no outside influence (i.e. musical influence) can change who I am ever again, nor will I get frustrated over music. Music has molded me to be who I am a long time ago. That’s why you won’t hear me undermine ANY other type of music now because I realized Syaza Farhana is actually a combination of a lot of genres, so why do I want to discriminate any part of it? Okay, I think I owe it to you to explain why I haven’t updated my blog for a long time. Well, as those supposedly close to me, you - *pointing to you* yup, you – should know that I’m currently in the middle of my finals. That’s why I made a conscious decision to not go online except to download some stuffs starting from…well, since the last post *points downward. * Anyway, I think the least I could do is give a small recap of what I’ve been up to since the last post. Well, after the whole World Religion debate thingy ended on that Wednesday, I went back home during the weekend to get ready for my three other presentations and also for my finals of course. 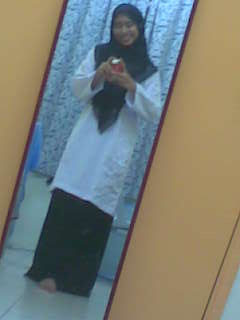 See, on Tuesday I had my Islamic Studies presentation. I know it’s really nothing since it’s just three minutes but I only found out the afternoon before that there was a miscommunication between my group mates (Zaim and Bai) and me. So, I had to redo my points after getting back from my Trial meeting that night (I’ll talk more about that later). So anyway Zaim had actually went and met our Ustazah and requested for our group go on first. So yeah, Zaim was calling me over and over the next morning when I was about two minutes late. Zaim and Bai were amazing I got to say. And I’m not just saying that because they’re my group mates. Zaim of course is a good speaker and Bai, well; he was just natural and also naturally sarcastic. (“Anda tak nampak tapi gambar di belakang ini sebenarnya gambar dacing. Ya, dacing itu seimbang dan adil.” I got your sarcasm Baihaqi.) I on the other hand didn't really put much effort into this presentation as I stick to the original plan of each person saying only up to three minutes. 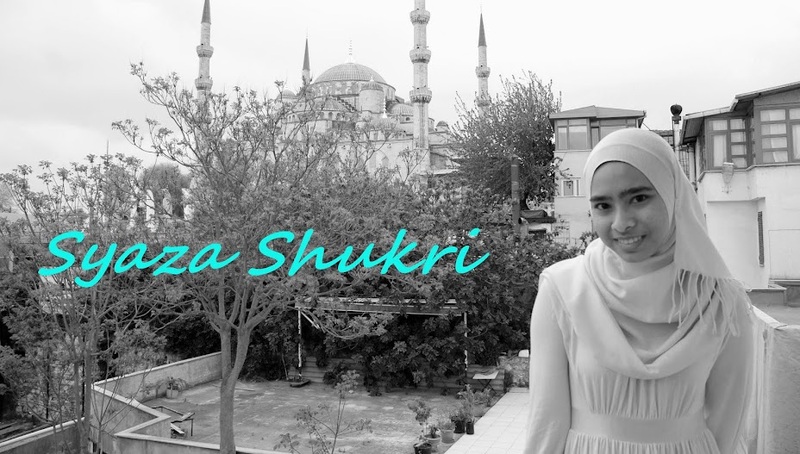 Lastly, it was time for my Islam presentation for World Religion. It’s nothing, really. But I stupidly and unconsciously took the job of being ‘kind of’ the group leader so I have to make sure everything was okay. But when it was my time I just read from my notes. What much can I say about Modernism in Islam except that I TOTALLY disagree with our textbook. Islam IS flexible, regardless of time and place. Oh yeah, I got to add that I won’t be around long because after I’m done with my finals I’ll be going to the BTN camp thingy in Shah Alam with the rest of us. It’s for five days, from next Sunday to the coming Thursday. When I heard camp, I got to admit that I kind of look forward to it since I love going jungle trekking and all…until I saw the schedule. LDK! I hate LDK! All the talks, and the pembentangan and the sleepiness…I can totally see myself sleeping in the hall already. I just want to pass the test so that I can fly. So yeah, my REAL holiday will only start after that. p/s: Oh, I would also like to add that my diet is officially over after I was dragged by ‘them’ to Secret Recipe three times in less than five days. Okay la, I may be exaggerating, they didn’t drag me, but point is, I’m yoyo-ing back to my previous weight.